If you are working on a kitchen remodel, there are many different design elements to think about. Whether you are picking paint swatches, imagining backsplash, or deciding between marble and granite countertops, it can be a challenge to combine functionality and design. Between cooking, cleaning, and socializing, the kitchen is a versatile room in the house, and it needs to be well-planned to meet all of your needs. One decision you might not realize can make a big difference is your choice of countertop edging. You may not have even realized that there were different options to choose from for the edges of your custom marble countertops. Some of these choices can make your kitchen safer and more comfortable, while others may complement a nuanced design. Whether your kitchen is the bustling hub for getting the kids ready for school, or a hotspot for weekend entertaining, choosing the right edge for your granite countertops can put the finishing touch on your kitchen. Bullnose: Bullnose edges are rounded, either on the top corner of the counter edge or on both the top and the bottom. These are especially safe if you have little ones running around and you want to avoid sharp corners. Bevel: Beveled edges cut a 45-degree angle across the corners of the counters. These can create a sleek straight edge that is also child-friendly and more comfortable to lean against. Premium: Premium edges for your granite or marble countertops include a variety of different cuts, such as ogee, Dupont, and waterfall. These options are highly customizable for a unique look to fit the design of your kitchen. No matter which cut you select, your countertop edges are integral to the form and function of your new kitchen. 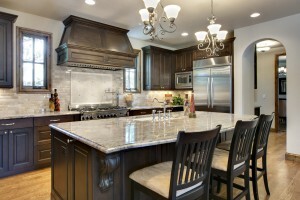 Be sure to choose a trusted local contractor who can advise you on the best selection for your granite countertops.